Morris Martin paints his creation in a woodshop class at Center Pointe. The screeching of the saw can be heard all the way down the hall. Upon entering the workshop, the amount of colorful wooden creations hanging from the ceiling and displayed on shelves overwhelms the space. In one corner, a table saw is manned by a skilled volunteer buzzing through boards. In the middle of the room, participants sit around a conglomerate of tables, painting and sanding. “We are about imagination here,” explains Tony Conrad, who is in charge of the woodworking room at Center Pointe, a day program for people with disabilities that uses the arts to encourage and uplift. 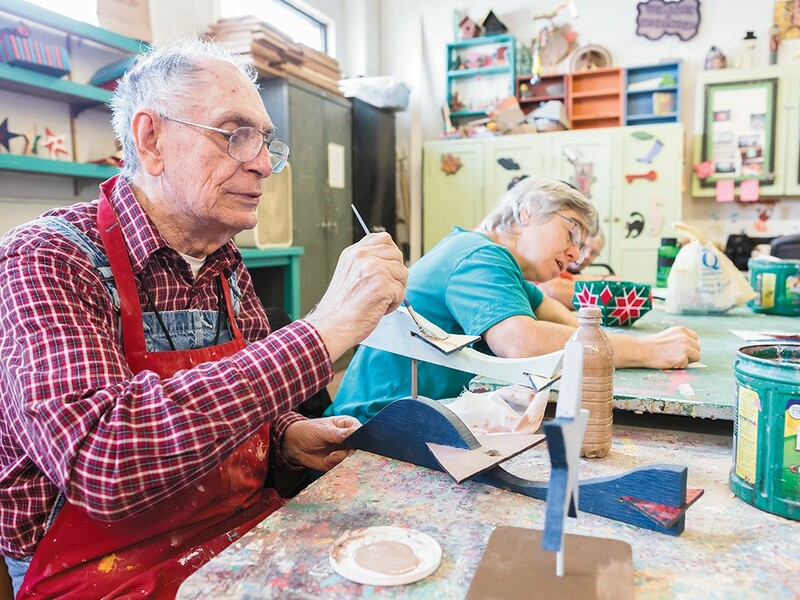 Other classes offered include ceramics, painting (watercolors and acrylics), basket weaving and needlepoint, along with social studies and computer classes. Group singing sessions, dances and putting on musicals are also an integral part of the activity at Center Pointe. Between 65 and 120 people participate Monday through Friday. Strahl, who joined the staff in January, says one of the biggest challenges the organization faces is getting its message out to the community. A quick drive-by of the bright yellow building on the corner of Washington and Sinto Streets doesn’t offer much help — the sign reads Center Pointe Event Center. “Even within the community of disabilities, people don’t know about us,” Strahl says. Often, advocates for music and arts nonprofits say their organizations see fewer monetary contributions than organizations geared towards disease research or immediate need centers. Central Valley High School seniors Katy Dolan and Philip Howard are working to ease that gap. Last year, at age 16, the pair started up the 501(c)(3) nonprofit LETEM Play: Life Enhancement Through Education in Music. The goal is to get instruments to students who wouldn’t necessarily be able to participate in band or orchestra because of financial need. Dolan is a member of the Central Valley High marching band, and both she and Howard play in the concert band. Forget everything you learned from John Hughes films — at this school, it’s cool to be in band. Last year, the marching band was one of the groups selected to play in the presidential inauguration parade. “We’re trying to fight the stereotypes that being in band or orchestra makes you uncool,” Dolan says. So far, the group has been able to fulfill every one of the applications they’ve received for instruments. At any time, people can donate old instruments (anything but pianos). Dolan and Howard then drop them off at Amend Music Center where they are cleaned and/or repaired. The instrument is then presented to the student. And however the LETEM Play endeavor may appear, Dolan says she’s not doing it for school credit or to make her college applications look impressive. “We wouldn’t still be doing this if it wasn’t for making a difference, instead of just college credit,” Dolan says. Once Dolan goes off to school next year, she is unsure about what will happen to LETEM Play, but she does know it’s something she wants to work on forever.